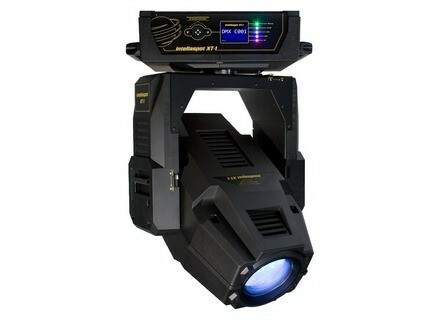 intellaspot XT-1, Other Conventional Fixture from Barco. The new intellaspot XT-1, a high lumen output/low wattage automated luminaire targeted to the mid-market, is now available. The intellaspot XT-1 is said to feature innovations in optics, lamp configuration, high lumen output, energy efficiency, zoom range and more for a highly economical price. The intellaspot XT-1 can produce a 20,000 lumens output from the 850w HID lamp, while also providing a large zoom range of 11°- 55°. It features a mechanical iris, variable soft edge, and electronic strobing, in addition to smooth CMY color mixing and variable CTO. A fixed color wheel allows color choices via exchangeable dichroic filters. Two rotating Lithopattern wheels, each with seven patterns plus open, provide output patterns and images. The output can be further enhanced with a rotating prism and an animation wheel. Built on a new platform, the intellaspot XT-1 is an energy-efficient fixture that conforms to modern “greening” principles. A battery-controlled full color LCD menu system enables fixture addressing without having to power up the unit. American DJ Quad Phase This LED moonflower can mix and blend 13 colors in all - red, blue, green, purple, yellow, cyan, white, light red, light blue, light green, light purple, light yellow and light cyan. American DJ Revo Burst The Revo Burst is a LED Moonflower from American DJ boasting a 46-degree beam angle and 294 LEDs arranged in 7 equal clusters that strobe and turn on/off in synchronization. Chauvet Cirrus Laser Chauvet Cirrus is a laser featuring a green and red laser web effect combined with a deep-blue LED ripple effect.